Throughout the history of art, artists have worn many hats. In that, I mean artists have not always stuck to one medium. This is true globally. In Western art, during the first twenty-five years of the 1900s, Russian artists were pioneers in modernism, producing the first totally nonobjective art. This coincided with the evolution of Cubism with Picasso and Braque, De Stijl with Mondrian and Doesburg, and German Expressionism. Russian modernist artists hoped that the Revolution of 1917 would usher in an appreciation for a revolution in the arts. Unfortunately, this was quickly quashed. The Communist revolution needed art to be realistic enough to convey the party line. So, many Russian artists moved to other parts of Europe so that they could explore their individual forms of modernism. Natalija Goncharova, along with Vasili Kandinsky (1866–1944), was one of the founding members of the German Expressionist group Blaue Reiter (1911). 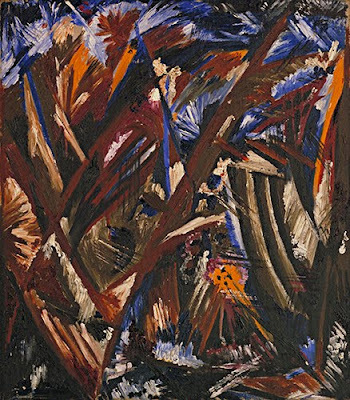 In 1912, she helped organize the avant-garde art group Osliny Khvost (Donkey’s Tail) in Moscow with her future husband, Mikhail Larionov (1881–1964). Although at the time she was influenced by Futurism—the offshoot of Cubism that emphasized movement and industrial energy—her work ultimately embodied a variety of abstract influences that eventually played out in her costume and fashion designs. Goncharova was born in central Russia and attended high school in Moscow. She studied at the College of Painting, Sculpture, and Architecture, deciding to become a painter. She met Larionov, a key pioneer of Rayonism, in 1900, and at the same time was influenced by Impressionism and Post-Impressionism. The link between Impressionism and Rayonism is interesting—Impressionism stressed the color of physical objects in light and reflected light, while Rayonism emphasized the visualization of light rays (color) bouncing off of and reflecting the forms of physical objects, rather than the objects themselves. Landscape 47 is firmly in her Rayonist period. Goncharova had her first and largest one-person show in 1913. She displayed works inspired by Russian icons and also works in a Cubo-Futurist and Rayonist style. She began designing costumes and stage sets for Sergei Diaghilev’s (1872–1929) avant-garde and internationally (Europe) acclaimed Ballets Russes (Russian Ballets). With the advent of the disastrous (especially for Russia) World War I (1914–1918), Goncharova and Larionov first immigrated to Geneva (1915), and ultimately settled permanently in Paris in 1917. Paris at the time was one of the European centers of modern art experiment. She produced remarkable costumes inspired by her Russian heritage, influenced by the paintings of contemporary avant-garde art movements such as Cubism and Rayonism. Between 1922 and 1926, Goncharova created designs for the fashion boutique Maison Mybor, designing unique clothes inspired by the international avant-garde. In her fashion designs, she bucked what was considered traditional, incorporating an intimate intertwining of images, including music notation, letters, fragments of words, and textual messages. 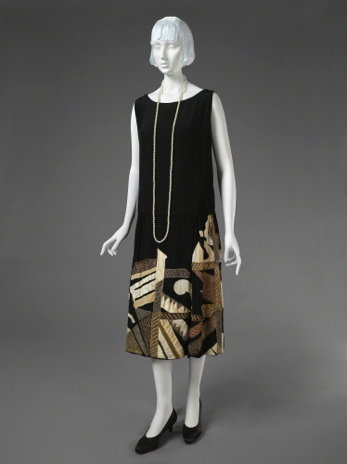 This dress contains references to musical instrument forms, but also reflects the influence of her Rayonist paintings.